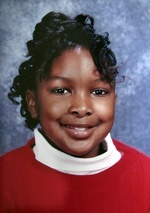 Cierra Nelson, 10, disappeared while walking home from her friend’s house in Flint, Genesee County, MI, in November 2000. Her body was found five months later on April 8, 2001, in a ditch in Mt. Morris Township, MI. Anyone with information about the slaying is asked to call Hosmer at 810.237.6945. Posted on Saturday, February 14th, 2009 at 9:40 pm. Last updated on Wednesday, March 9th, 2011 at 2:56 pm.